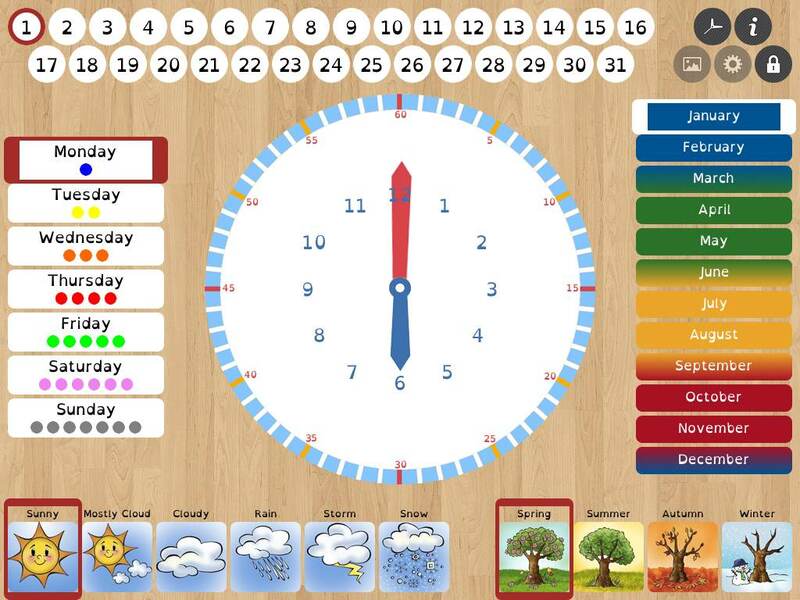 The app developer designed the app for use with children working on time concepts such as minutes, hour, half hour, days, months, weather, and seasons. Easy manipulation of the clock allows for instruction as well as interaction between a client and an SLP. With 2 main pages, Home and Settings, the app’s easy navigation allows the user to interact with a clock and it’s minute/hour hands, days of the month, days of the week, list of months, and icons for weather and seasons. The app opens to the home screen and reminds the user that the settings and insert picture page are locked unless you press and hold the “lock” icon (great for touchy, kid fingers). EASY manipulation of the clocks hour and minute hand. 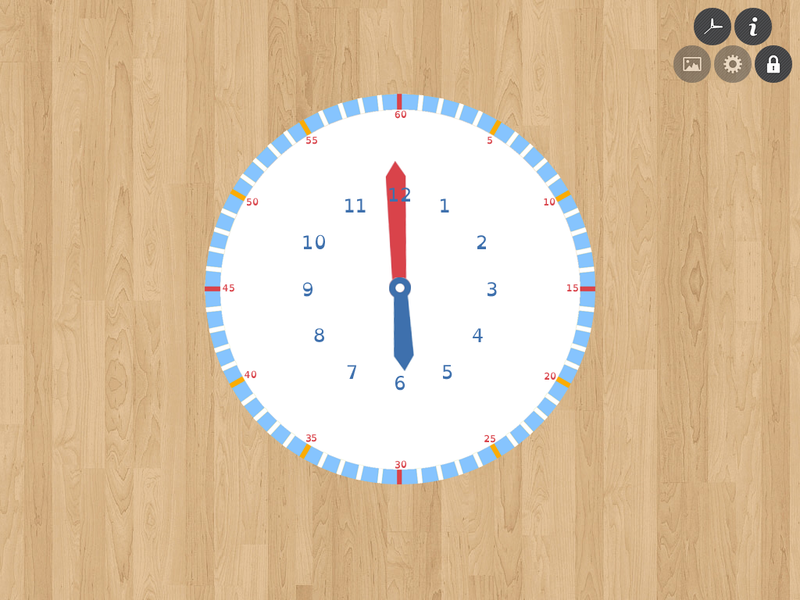 You can add icons (either pre-set or add your own) on the clock itself to create a daily schedule or discuss when certain daily activities occur (i.e. breakfast, lunch, bath, brushing teeth, etc). Cute, cute CUTE illustrations from Les Pictogrammes. It auto-sets the clock when you open the app to the current time. Days & months are colored coded, which can also be customized in settings. Seasons and 6 weather condition choices are available at the bottom. The app comes auto-locked. To unlock for settings, simply click and hold lock button. Great feature. Add a digital clock that reads time as the clock is manipulated. A seconds hand that can be turned on/off as higher levels of time concepts are reached. Would love to see them on Twitter!! While the app developer’s intentions for Niki Time are to offer a way to create a visual, picture schedule, I find it useful to teach time concepts such as When certain events occur during the day. It also aids in discussing passing of time by manipulating the page elements, such as day of the week, month, and seasons. Have the child “plan” out their day by asking When questions, such as “When do we eat breakfast?”. Place an icon from the stock photos (or your own custom ones) at various time throughout the day. Add different contexts such as during February we celebrate Valentines day, or in December during Winter it snows. Turn on/off modes that may distract or overwhelm a client in the settings bar; as more progress is made, add more modes to discuss time concepts. Pieces of the display can be turned off, as seen here to make it less busy or adult-friendly. Hoodless, P. A. (2002). An investigation into children’s developing awareness of time and chronology in story. Journal of Curriculum Studies. 34, 173-200. 35 children ages 3-9 years were read stories and then discussed the books using “Deictic” terms, which places events in time and estimates time duration. The 3-4 year-olds were concerned with “clock time” but unable to consistently or accurately use the deictic terms, while the 6+ year-olds used general time markers in their discussion (i.e. “about 2 hours” or time estimates).